One only needs to look at the success of programmes such as ‘Time Team’ to see the popular appeal of archaeology. It is a subject that fascinates many due to its ability to uncover links to the past and enable us to better understand how people lived. The archaeology of the First World War in particular seems to have a certain poignancy, perhaps due to the indelible effect of the war on the public psyche and because it offers a window to understanding how our ancestors who took part in the war may have lived, and indeed died. Yet First World War archaeology is by its very nature the ‘new kid on the block’. Some may even argue that the conflict is too recent for archaeology to be able to tell us anything we cannot find out from other sources. However, in ‘Killing Time’ Nicholas Saunders persuasively argues the merits of the discipline. Much of the book looks at the development of First World War archaeology, with separate chapters on France, Belgium, and other theatres such as Italy and Gallipoli. Focusing on the western front Saunders describes the immediate post-war battlefield clearance and recovery of bodies, the birth of battlefield tourism, and the formation of amateur archaeology groups in the late 1980s. The ‘seedier’ side of battlefield archaeology (looting and accusations against amateur digging groups) are mentioned but not covered in great detail. Some conceptual issues are explored, for example the link between war and the landscape (trenches and artillery effectively shaping the landscape), and the ‘landscapes of destruction’ creating new meanings; a prime example of this is the Butte de Warlencourt, the ancient burial mound that dominated the Albert-Bapaume road near Le Sars, became a key objective for the British, an area of pilgrimage after the war, and in more recent years was sold to the Western Front Association. Saunders also examines the impact of the war on archaeology itself – the intense shelling and digging of trenches often uncovering evidence of our prehistoric past. Yet the most interesting parts of the book are those describing the digs themselves, what they found, and what they can tell us about life in the trenches. Whilst it is almost inevitable that digs will uncover human remains due to the amount of casualties, sometimes other evidence of the war is uncovered – a prime example being the discovery and excavation of a British Mark IV tank at Flesquieres in 1998. 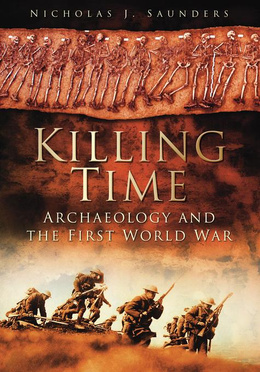 The book was originally published in 2007; this revised edition, published in 2011, includes updates on digs in the UK, Ploegsteert, and Jordan as well as brief details of the well-publicised project at Fromelles. With developments such as the La Boiselle project and recent dig at Messines, another revised edition will no doubt soon be required and would be very welcome. Some of the themes in the book would benefit from further exploration, but overall this is a fascinating introduction to the archaeology of the Great War.